A series of photographs by Saira Awan capture the family lives of residents of the Gascoigne Estate. 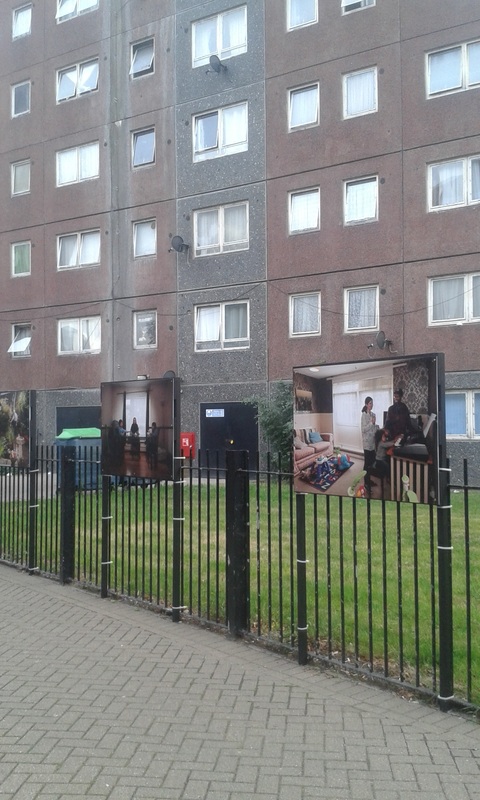 These were on display in the public space around some of the buildings as part of the Open Estate Festival. The Open Estate Project is a London mapping project of a different sort- documenting the memories and reflections of residents of a large housing estate in London that is currently being redeveloped to make way for new housing. It is one of the many projects of Studio 3 Arts, a charity set up to develop and deliver socially-engaged, co-created artistic practice in North East London and West Essex. A fascinating collection of visual material resulted from the project – this includes portraits of families relaxing at home, as well as photos of the Estate during moments of pivotal change – showing residents doing everyday chores with the bulldozers at work in the background, or capturing the effect of the seasons on an urban landscape that will never be there again – like the modernist checkerboard created by the snow-covered paths and buildings. An exhibition of wide ranging artistic output captured personal reflections on what objects and items people cherished, made out of clay - an old bathtub, a laptop, plates and saucers. 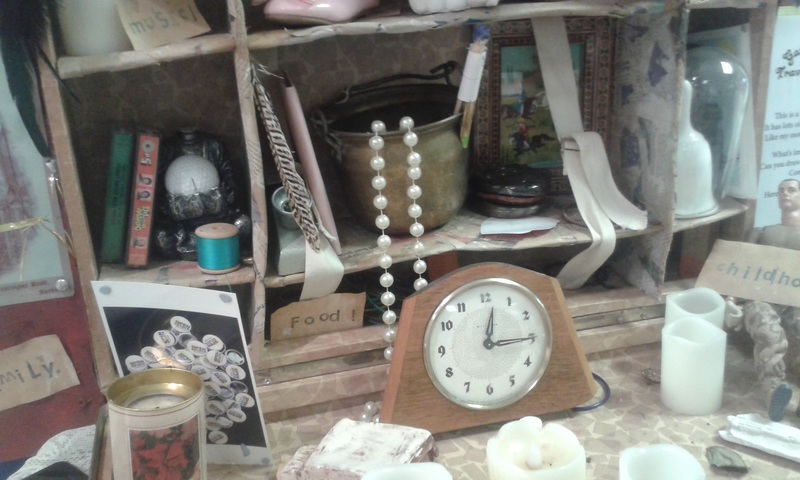 To complement that, a cabinet of travelling treasures displayed people’s real mementos: an action man doll, a mantle clock, a pearl necklace. Open Estate asked local residents to think of what was valuable to them and why. Here are some of the answers. 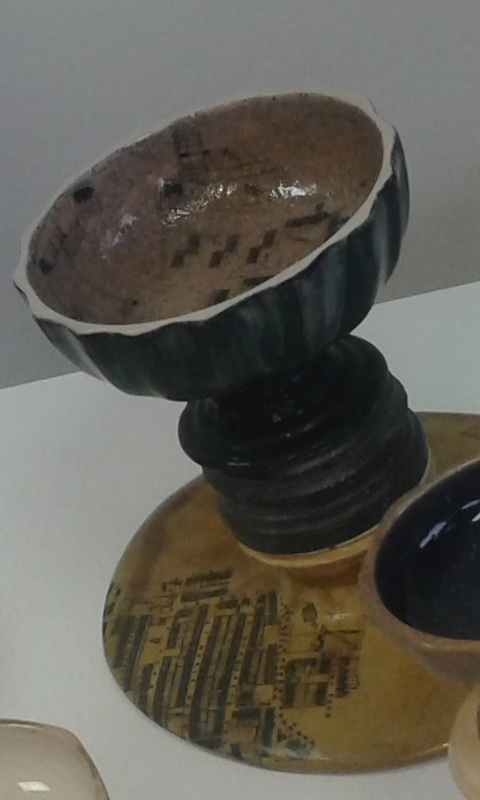 One of a collection of goblets created to represent the urban evolution of the Gascoigne Estate, from the property of the aristocratic Gascoigne Family, to Victorian terraces, to the current, rapidly disappearing, blocks of flats. A ceramicist, Simeon Featherstone, worked with local residents of all ages to produce a collection of glazed ceramic globlets, made of clay dug up from the estate itself, some of these include imprints of Gascoigne’s textures: the coarse fibres of a carpet, and the swirls of wall paper. Among the most fascinating were pieces with maps of the different phases in the life of the estate – like the ones shown here, placing the plan of Victorian terraces below that of the 1950s blocks that replaced them, the very structures that are now being erased. The goblets were a nod to the history of the Gascoigne family, wealthy aristocrats who once owned the land. Apart from its obvious benefits in bringing a community together to share and support each other during a period of significant change, a project like Open Estate is of great value to urbanists, and to those historians of the future who can look back at its photos, its drawings and its recordings, and understand first-hand what sort of community this was, in many different ways. It is exactly the sort of information Layers of London can help preserve. As Steve Lawes, Trainee Project Manager for the Open Estate Project says “The Layers of London project is a fantastic opportunity for ordinary people to access their history via visual and written records. It will allow multidisciplinary and multimedia archival and personal histories to be easily accessible, easily edited and easily understood. To find out more about this fascinating project click here.